There’s a new business in town that exists for one main reason: to reduce your stress. Lakewoodite Ashley Ciresi is a luxury productivity consultant, offering her services to help organize life’s “stuff” so that her customers can have more time to do what matters most to them. The Chamber Bright Stars for 2018 were recognized on Thursday, October 25th at the semi-annual Chamber Leadership meeting and tenth annual Chamber Bright Star Awards presentation of the Northern Ohio Area Chambers of Commerce (NOACC) at Pinstripes in Orange Village. CERNY SHOES has been a fixture in downtown Lakewood for years. In fact, Don and Marlene Cerny are third generation owners of the Men’s and Women’s shoe store. Since 1903, the Cerny family has serviced the footwear needs of customers on both the East and West side of Cleveland. Cerny Shoes is the last remaining store of Zak Brothers Shoes, an eleven store chain which was in business during the early 1900’s. William P. Cerny was the president of Zak Brothers Shoes at the time. When the Great Depression hit, one store of the eleven remained, which is Cerny Shoes today. Don’s parents, Robert and LaVerne, bought the store from Bill Cerny when Don was a child. They supported a family of six children for many years and retired in the mid 80’s. Don and Marlene have owned the store since then. Jamie Garrett is a server at Deagan’s Kitchen, an expecting mother, and an aspiring forensics student. The fact that she’s missing most of one arm is a fact of life, but it doesn’t define her identity. Even if you pass time at Deagan’s, you may not notice unless Garrett serves your table. From further away she’s difficult to distinguish from other staff. Bustling back and forth with plates and drinks, she keeps up with colleagues despite physical difference. Someone else could carry more at once, all else being equal, and Garrett asks for help with things occasionally. But for practical purposes, she manages perfectly well. Sometimes “they forget that I have one arm,” she says of her coworkers. The reality is more apparent for Garrett. Long practice has not made carrying groceries into the house easier, for example. She drives without problems, but manual-transmission cars are out of the question. But this is essentially a reality she has always known. A quirk of fetal positioning meant that her left arm never fully developed. She’s been learning to do things with just one hand since infancy, from tying her shoes to playing sports to playing an instrument. Around third grade, Garrett briefly tried a prosthetic but it seemed alien to her. “I hated it,” she recalls. School classmates didn’t always practice respect and understanding, but Garrett found good friends and refused to be left out of extracurricular activities. Growing up in Parma, she played fast-pitch softball as catcher, and learned the trumpet. By 16 she was working as hostess at an Outback Steakhouse, and she has worked in the service industry since. “I figured it would be difficult at first,” Garrett says, but it went well enough that eventually she spent more time attending tables than phones. Based on the experience, she applied successfully to be a server at Melt Bar & Grilled, and most recently at Deagan’s. Garrett says she works 50 or sometimes 60 hours per week, now, and feels very appreciated by coworkers and regular customers. “I love my Deagan’s family,” she says. Higher education remains on her mind as an eventual goal. Garrett says she’s interested in criminal justice, possibly forensics. In the meantime, she’s also contemplating a move back to Lakewood—from Fairview Park where she currently lives—and impending parenthood. Despite a lifetime finding ways to do things with only one complete arm, Garrett expects real challenges from an infant. Though she hasn’t regarded herself as part of a disabled community, generally, in this instance she is looking to others’ examples for reassurance. “I’ve seen people succeed at this,” she says. As long as it’s possible, Jamie Garrett is up for the challenge. Ines Rehner of Sweet Designs Chocolatier in Lakewood took a step toward greater business success by completing the Goldman Sachs 10,000 Small Businesses program at Cuyahoga Community College (Tri-C). Ohio families can avoid the reduction in student achievement caused by summer vacation by accessing a low-cost internet service offered through Cox Communications known as Connect2Compete (C2C). In addition, Cox also announced the expansion of the Cox Digital Academy to include free Spanish-language resources designed to broaden opportunities for the Hispanic population through technology. Kidzenia - A New Childcare And Learning Center In Lakewood! The city of Lakewood is a wonderful and rich community that is composed of people from all walks of life. In recent years we have seen many additions and improvements to our beautiful city, helping to making Lakewood an attractive place in Northeast Ohio for people to live and small local businesses to thrive. KIDZENIA is a new childcare and learning center that aims to become an integral part of the community by helping to meet the many needs of Lakewood’s diverse families. Lakewood Native Creates Software Development Career Pathways For Busy Locals! Computer coding skills can open doors to a challenging and lucrative career in the ever-growing software development industry. But traditional coding bootcamps are often not a viable option for people with a full-time job or family responsibilities – a demographic that often includes women and minorities. That’s why I developed an innovative solution. The new “hybrid” bootcamp, named FlexCode™, offers a mix of online and in-person classes for greater flexibility, lower expenses, and a more effective learning model. In what promises to be an exciting year for StartUp Lakewood, Cox Business has signed on as an official sponsor of the 2018 program. With numerous startups among its local client base and a vibrant entrepreneurial community in its backyard, supporting StartUp Lakewood was a natural fit for a company like Cox Business. When Barry Buick closed after nearly 65 years in business, auto technician Tim Skettle was out of a job. Skettle started at Barry in 1984 and was quite content to stay until retirement. Over the years he considered going out on his own but he liked where he worked and the cost of opening a full service repair shop seemed out of reach. The sudden closure of Barry Buick forced him to make a decision. Many auto dealers were eager to hire an automotive technician with 33 years of experience who is ASE certified in mechanical and electrical service so Skettle was not concerned about finding a job. However, the more he thought about it the more he liked the idea of being his own boss and being in control of his own life. If possible, could this logo please be added to the story of Waterbury Coach House remodeling which was submitted yesterday (April 5) ? When the Waterbury Coach House at 13333 Madison Avenue in Lakewood holds their grand reopening--projected for May 1 after extensive remodeling-- customers will be treated to an expanded menu of American and ethic home cooking (including the restaurant’s signature garlic soup), a wide selection of trendy cocktails, live music, and the ever-popular trivia. The City of Lakewood has many businesses that have been around for extended periods of time and are staples in our great city. Lakewood Dairy Queen opened in 1978 and is celebrating their 40th Anniversary this April! Songsten Gampo Buddhist Center of Cleveland has opened this past weekend in Lakewood. Here at Songsten Gampo, we provide opportunities for all, Buddhist or not, to discover the importance of wisdom and compassion in everyday life through meditation, classes, and more. Our resident teacher, Buddhist nun, Ani Palmo Rybicki, is one of the most highly trained instructors in the country and has been teaching in the Greater Cleveland area for the past 12 years. "While we provide a home for Buddhists, we are open to those of any faith and to those of no faith at all,” says Ani Palmo. “We offer the tools to transform the mind and heart. However people choose to use them is up to the individual." The Bookshop In Lakewood Is Moving! Celebrate With 20% OFF Everything! Well, it has been a fantastic 3½ years in this, our first location! I REALLY was not sure we would weather the storm of our first year. We opened with a $5,000 loan and starter stock pulled from my personal book collection, and have managed to keep rolling our sales back into making slow improvements for the shop. The surrounding neighborhood has been wonderful to us, and I hope they find us again as we shift seven blocks East down Madison. Our last day open in this location will be Saturday 1/27, and we are running a SALE until we close. EVERYTHING in the shop is 20% OFF, and while there are no guarantees, I will consider offers made on collectable titles. The shop weighs about 5 TONS, and I would really like to see some of these shelves empty out before I have to box and transfer them. Dr. Kevin Marshall has opened the new Comfort Dental office in Lakewood. America’s largest dental franchise company, Comfort Dental’s mission is to expand access to care by making it affordable and convenient. Conveniently located at 17500 Madison Avenue, Dr. Marshall is now accepting new patients and can be reached at 216-302-2401. Walk-ins are welcomed. “Comfort Dental has been a pioneer in supporting local, dentist-owned offices that provide affordable care to all types of patients,” said Dr. Marshall. “Like most dentists, we treat patients with private insurance. Unlike most dentists, we treat Medicaid and uninsured patients as well." New patients are just $19 including exam and x-rays (payment due at time of service). Generally, Comfort Dental’s fees are 25% - 30% less when compared with other dentists. Laura Ross of Cleveland Vegan in Lakewood took a step toward greater business success by completing the Goldman Sachs 10,000 Small Businesses program at Cuyahoga Community College (Tri-C). Welcome to the newest sweet shop in Lakewood...Sweet Amelia's. Lovingly named after, and inspired by, the owners Grandmother, Amelia Dodaro. As spirited entrepreneur and business woman, she opened a grocery/meat market in Central Cleveland that also offered homemade bakery and candy. At Sweet Amelia's, you will find a warm and charming atmosphere filled with homemade pastries, handmade chocolates, nostalgic candy and specialty gifts. Solstice Roasters, a premium coffee roaster based out of Downtown Cleveland, provides the shops delicious coffee. Hot tea and homemade cocoa are also served. As such, the mornings will be a great time to stop in for a hot beverage and breakfast pastry as will the afternoons with a selection of unique bakery treats. Lakewood just got a whole lot sweeter! Insomnia Cookies, known for its warm, delicious cookies has opened its doors to the public. 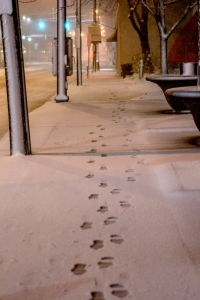 We are excited to announce that we will now be open and serving warm cookies until 3 AM every day. Insomnia’s cookies are delivered warm out of the oven and straight to the customer’s door. Popular cookie flavors include Chocolate Chunk, Snickerdoodle, Chocolate Peanut Butter Cup and the S’mores Deluxe. Insomnia Cookies also serves and delivers two sizes of cookie cakes and a brownie with the option to add toppings such as cookie dough and sprinkles. The requisite pint of cold milk can also be added to any order. There’s a ‘buzz’ around town about a new café opening soon right here in Lakewood Ohio – "Play Grounds!" "Play Grounds" aims to be the café of choice to which parents and loved ones come to enjoy a cup of coffee or tea while their children engage nearby in creative play. Walthall CPAs is proud to announce that Partner Charles P. Battiato, CPA.CITP, was recently appointed to the Lakewood Catholic Academy board of directors to serve a four-year term. Walking or biking to see the displays on Madison Avenue from Oct 5th thru the 22nd --the dates for the scarecrow festival-- are the best ways to get an up-close view. We are sure you will want to get some selfies with Bigfoot and other one-of-a-kind compostions. While the supplies last inside of the Carabel Beauty Salon & Store, we will have a table with some samples to try at home for various beauty products. Also, enter a drawing for a make-over for a female. The Lakewood Chamber of Commerce will host ‘Tell Us Your Story powered by PechaKucha,’ an informal and fun gathering where community and business leaders will share their career stories and entrepreneurial journeys in the PechaKucha 20x20 format. The event, organized by the Chamber’s Education Task Force and sponsored by Lakewood Public Library, will be held on Thursday, September 21st at Around the Corner in Lakewood. Have A New Business Idea? Apply For The 2018 Lakewood Ideation Challenge! Do you have an idea for a business or product which absolutely needs to be brought to market? Are you willing to put some time into actually making that happen? The 2018 Lakewood Ideation Challenge may just be the competition you've been looking for. You just came up with a new groundbreaking business idea. Maybe it’s a new unique storefront you plan to open up on Detroit Avenue. Or perhaps it's a mobile app that will have much broader applicability — with users from Lakewood, Ohio to Lakewood Colorado (and everywhere in between). No matter the idea, where do you start? If your first inclination is to get started writing a 20-page business plan, you may want to reconsider. The Lakewood Chamber of Commerce has announced the recipients of their 2017 Outstanding New Member, Business Person of the Year, and Small Business of the Year awards. Choosing insurance is hard, we can help! Healthmarkets is now open in Lakewood at 16506 Detroit Ave. If you’ve driven by 17409 Detroit Avenue across from St. James Church recently, you may have noticed a new shop, Knits Knots Stripes & Dots and wondered what it's all about. Owner Beth Kiraly-Bratko spent many years working at Closets consignment shop, and finally decided it was time to follow her dream and open her own children’s resale boutique. Beth says, “I love kids, I love clothes, and I love Lakewood.” Beth is a Lakewood High graduate who lives in Lakewood with her husband, Brad Bratko. They have three children, so Beth is naturally up-to-date on current trends and styles in kid’s clothes. Putting the shop together was a labor of love for Beth, her husband, mom and step-dad. The four worked in concert to renovate the space, making it the appealing store it is today. The Taste of Lakewood, presented by the Lakewood Chamber of Commerce and Cleveland Magazine, will be held on Sunday, June 11th from 1-7pm at Madison Park. The Taste of Lakewood is a no-admission fee, outdoor day-long food and music festival that celebrates Lakewood’s reputation as a great food destination. Over 25 of Lakewood’s best restaurants - including Forage Public House, Angelo’s Pizza, El Carnicero, Barrio, Georgetown, Mars Bar, Salt, and Sarita - will be on hand to sell their food to a hungry audience dining al fresco and enjoying great music on the park grounds. The Taste of Lakewood has served as a coming-out party for Lakewood's newest restaurants and this year is no exception: Yuzu, Upper Crust Pizza, LBM and Distill Table will make first-time appearances at the event. Two business owners from Lakewood — Michael Murray of Textbook Painting and Andrew Rainey of Randy’s Pickles — took a step toward greater success by completing the Goldman Sachs 10,000 Small Businesses program at Cuyahoga Community College (Tri-C). Gordon Tower Insurance Agency Is Celebrating Our Ten Year Anniversary! Gordon Tower Insurance has been successfully operating for a decade as of June 1, 2017. The 10 year anniversary milestone is cause for even more celebration as we moved our agency to the INA building in Lakewood from Brook Park over a year and a half ago and are very happy here. Lakewood has been Mary and Michael’s hometown for the past 18 years and where they have raised their 3 children. Michael J. Bodnar, President and Owner of Gordon Tower Insurance Agency has been successfully selling insurance as a licensed agent to a wide variety of customers for nearly 30 years. He started his insurance career with Allstate in 1988 upon graduating from college. Michael’s family comes from a long history in the insurance industry with the startup of his grandfather, prominent Attorney Gaspar A. Corso, of Ohio Valley Insurance in 1952 in East Liverpool. Gap moved Ohio Valley Insurance to downtown Cleveland in 1953, where it operated and grew exponentially until 1971. Michael became an independent agent in 1994 with Tower Insurance; the agency side spin-off from Ohio Valley Insurance. New Cookie Bakery In Lakewood Is Open For Business! Have you been searching for that perfect little extra-special treat to complete your next event or party?! Look no further -- Stephen Watkins, rising start on the local culinary scene, has officially stepped onto the public platform by launching a new bakery, based right here in Lakewood, Ohio! The Lakewood Chamber of Commerce 2017 Scholarship recipients have been announced and will be honored at the Taste of Lakewood on June 11th at Madison Park. The Lakewood Chamber of Commerce scholarship program, established in 2000, awards scholarships each year to four high school seniors who have demonstrated exceptional dedication to their studies, extra-curricular activities, and, just as importantly, a commitment to working at a part-time or full-time job during their high school years. Over seventy young men and women have received Lakewood Chamber of Commerce scholarships over the past 18 years. This is a special day that began in the year 2005. Our salon only found out about it this year, 2017 is our first year for Tiara Day. Our service with tiaras started when a mom called in to honor her daughter's request for an experience like the first Princess movie, where the princess gets her hair done. Of course we thought she should leave with a tiara too. The collection of Disney movies are well-known and loved by the little girls. Enjoy the Lakewood's largest food & music event in VIP style: purchase VIP tickets for the 14th Annual Taste of Lakewood. As Cleveland Metroparks enters its centennial year, take a look back - and a look ahead - at the park system bordering Lakewood that was recently named ‘Best In Nation,’ winning the prestigious 2016 National Gold Medal Award for excellence in Park and Recreation Management. "The Gold Medal Award honors communities throughout the United States that demonstrate excellence in long-range planning, resource management and innovative approaches to delivering superb park and recreation services with fiscally sound business practices." -- nrpa.org/goldmedal. Cleveland Metroparks Chief Executive Officer Brian Zimmerman will speak about the park system's centennial anniversary in his address to the Lakewood Chamber of Commerce at the Chamber's April 7th luncheon meeting at The Clifton Club, 17884 Lake Road. The cost is $20 for members, $25 for non-members. For more information about this event and to register, visit lakewoodchamber.org. Cassandra Leigh Bishop, LHS class of '98 and Cleveland State University Master's program graduate has published a children's book! "Teddy's Journey to the Clouds" is available on Amazon and at your local libraries. The book was written for families dealing with the terminal illness of a child. The demand for quality food industry employees is at an all-time high. How do restaurant owners, caterers, and retail food operators identify, hire, retain, and motivate the best people? How do line cooks, dishwashers, bakers, servers, chefs, hosts and managers affect the dining experience? Members of the Lakewood food and restaurant community gathered on February 28th at Ranger Cafe @ West Shore for a roundtable discussion of issues related to hiring in the hospitality industry. The event was moderated by New York Times Best-Selling cookbook author and Cleveland Scene dining editor Doug Trattner. After an opening exercise to determine best practices - and critical pain points - in the industry related to sourcing, hiring, and retaining employees, the discussion then turned to specific labor situations and economic conditions faced by restaurant and food service managers today. Event sponsors Cuyahoga Community College Hospitality Management Program, Towards Employment, Cornucopia, Inc., and West Shore Career-Tech Culinary Arts/ProStart presented brief overviews of their programs as possible sources for hospitality industry employees. Beck Center for the Arts is pleased to announce the appointment of a new Chairman to the Board of Directors. The Lakewood Chamber of Commerce invites you to join us in celebrating Lakewood’s thriving food and restaurant scene – be a part of the 14th Annual Taste of Lakewood, to be held on Sunday, June 11th 2017. Six-year-old, Cleveland-based Rising Star Coffee Roasters launched a coffee bar inside Bottlehouse Brewery’s Madison Avenue location on December 19th. It is the coffee company’s fourth retail location with all three previous cafes located in Cleveland. The Cleveland Shambhala Mediation Center moved to its current location at 17903 Madison Avenue in Lakewood five years ago. Part of a global network of over 200 centers, its vision is to establish an enlightened society, a culture in which life’s challenges are met with kindness, generosity and courage. Underlying the Shambhala vision is that each human being has a core nature that is basically good and worthy of a spot on this earth. This basic goodness is always with us; we just need to cultivate its natural intelligence and compassion. We do that, according to Shambhala tradition, through the practice of meditation. Lakewood Chamber January Luncheon: "Region On The Rise"
Join the Lakewood Chamber of Commerce for the first event in the 2017 Speaker Series. Ms. Deb Janik, VP of Real Estate & Business Development for the Greater Cleveland Partnership, presents “Region on the Rise”: a discussion about the impact that important events such as the NBA playoffs, the Cleveland Cavaliers NBA World Championship, the Republican National Convention, the Cleveland Indians’ playoff run, and the MLB World Series have had on the region, and the increased visibility and economic development forecasted for the Cleveland region in the years to come. The Lakewood Chamber of Commerce announces the 2017 Speaker Series, quarterly presentations featuring headline speakers who will discuss some of the region’s most interesting and relevant topics. It's 6pm on a Tuesday night. The sun has already set and the evening is dark. Midnight dark. It's winter time. It's cold. It's already getting old. AND it's only December. 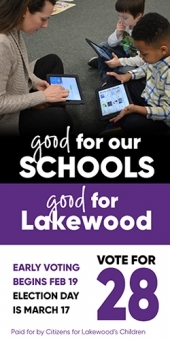 Lakewood successfully launched its Lakewood Public Network, a state-of-the-art fiber optic network that offers high-speed fiber connectivity to the city's schools, public library and 16 City of Lakewood facilities. Lakewood residents will have the opportunity to learn about adding solar panels to their homes at discount prices at an upcoming forum at Lakewood Public Library. Northeast Ohio company YellowLite solar will present information about the benefits of solar and how residents can get bulk rate prices as part of the Cuyahoga County Solar Co-op at the Library main branch on Thursday, December 15th at 6:30pm. The event is free and open to the public. Claire Coder isn’t your typical 19 year old Ohio native. After attending a semester at Ohio State and learning college wasn’t for her, she dropped out to pursue building Aunt Flow full time. On November 21st, the Lakewood Chamber of Commerce kicked off the 8th annual Holiday Bid & Buy online auction showcasing items donated by some of the area’s best locally owned businesses. Technology and Social Media are great, but they cannot replace human touch or personal face to face contact. It is sold everywhere - food store, drug store - hair color in a box. Our salon is unusual in that if you really like that box color, we will apply it for you. Just to make it easy at home, color is applied all over the head, roots to ends. If you have never ever colored your hair, issues that occur include your not being able to see, so some spots can be missed. Also, the body temperature from scalp to about 1/2 of an inch down your hair will change, causing the color to change. The issue of how porous your hair is affects the degree to which the color will be absorbed. Over the past several years Lakewood has become a key player in both the local food movement and the independent restaurant scene here in Northeast Ohio. As of just last week, there is now a new kid in town that brings together the best of both of those worlds under one roof - Nature's Oasis. The double storefront on Detroit Road just west of downtown Lakewood is one part cafe, one part marketplace, both with the aim of supporting local purveyors and producers of all natural, healthy food. Owner Elliott Endsley, has created a bright, inviting space that can be seen from the street through the large picture windows spanning the width of the cafe. The industrial modern decor is punctuated with cheerful green metal chairs, copious amounts of reclaimed wood, and metal caged edison bulb light fixtures. The cafe feels spacious, offering patrons plenty of room to sit and enjoy anything from a cup of coffee (roasted locally and available as drip or pour-over) with a (locally baked) pastry to hot soup (which you can also sometimes buy and take home with you from the freezer section) to a sandwich (made on Breadsmith bread). As one might expect based on my description thus far, the cafe menu, as well as the market, take into account a variety of dietary restrictions, making it easy to find something for everyone to eat. That includes, as my omniverous husband was glad to hear, meat. Etech Computers has been in business going on almost 7 years during which we have been providing a wide variety of services for residential and business customers. Recently we have relocated to the center of Lakewood 14411 Detroit Ave. across from Namaste India Garden and right next door to TJ’s Butcher Block. The Lakewood Chamber of Commerce hosts an annual Speaker Series that features well known business, economic development, and political leaders from the greater Cleveland region. Join us for the fourth and final event in the Chamber's 2016 Speaker Series on Friday, October 21st. Cuyahoga County Executive Armond Budish will speak on the topic: "What County Government is Doing for Your Business". The luncheon will be held at Brennan's Catering & Banquet Center, 13000 Triskett Road in Cleveland. Registration and networking begin at 11:30 a.m. The cost is $20 for members, $25 for non-members. Register online at lakewoodchamber.org. The new trend which is growing here in Lakewood is dressing up to hand out treats to the kids. I have noticed that as the family is going out Halloween to trick and treat parents and kids get dressed up. Make sure this season you don't miss the scarecrow displays on Madison Ave. Walking about the businesses will give you the best views. Some of the new things Carabel Beauty Salon & store has found for Halloween are hair bows in black and orange with witches, pumpkins, and spiders. Skeletons for earrings , some glow in the dark co ordinate with barrets fashioned in bony hands some in grey, black, and orange and others in colors that glow in the dark. Parties or candy handing out nights are good times to dress up in a way that you are not too scary for the little kids, and people still know who you are but you have that extra Holiday touch. By the way stop by and see our scarecrow display our demented clown will be here will you? Starting on November 21st, the Lakewood Chamber of Commerce will begin an online auction showcasing items donated by some of the area’s best locally owned businesses.